Two months no news. Hmmm....Mamarazzi getting super lazy. Many moons ago, I was not feeling well . Ponteng school for a day. ( hope teacher didn't see this post). What did I do at home ? Of course not resting-lah. Am the type that cannot sit still. Guess teachers very happy that I didn't go to school gua. 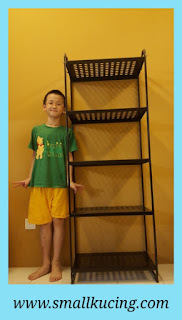 Anyway, I helped Mamarazzi assembled two racks. Way taller than me. Gotta climb up the stairs. Taller than me , right? Ah...it's good to sweat out the fever. Felt way better after building this. Bet Mamarazzi's plant felt much better too in their new "condominium". 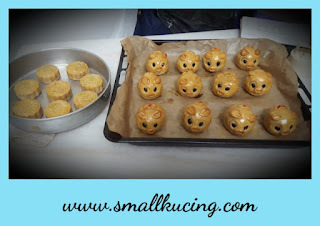 As for Mamarazzi....she is busy baking these cute mooncakes now. Mooncakes festival coming soon. I like that rack. Quite strong can support all those flowerpots. Where did Mamarazzi buy it from? So fast mooncake festival coming. Love those cute piggies! Hello, I am glad you are feeling better. 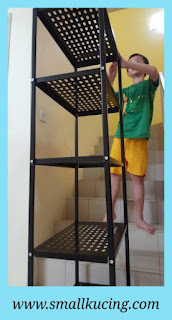 You took advantage of the time to help buidl the rack. It looks great. Happy Thursday, enjoy your day! Wow! You are so clever to do the rack by yourself. Well done. Soon you would be as tall as the rack. Mamarazzi's piggy mooncake business is doing very well. School holiday is coming so enjoy yourself, ya! Wahhhhhh!!!! You are so tall now! Thin and tall! Nice condo...and cute piggy mooncakes. Can make for sale, sure nicer than those sold outside one. Steadylah you and your mama. 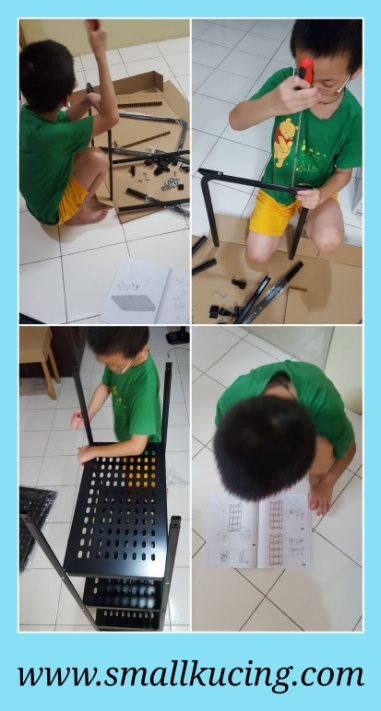 Good with your hands and very rajin! haven't been here for some years & you are a big boy already!! Have I missed harvest moon festival. I thought it was like in September/ October. What a darling boy you have and the cakes are spectacular. O, hello there, lil kitten ... smiles ... glad to have you back ... smiles ... Love, cat. 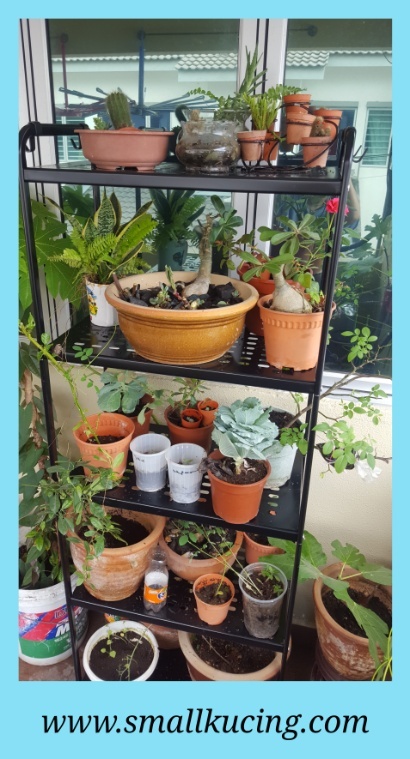 You did great job building the racks for the plants! They sure look very happy in their new condominium :-) The mooncakes look very cute and yummy. Mooncakes festival sounds lots of fun! A good thing you are feeling better and can now look forward eagerly to those mooncup cakes! I see the condominium, I also see how happy the plants are. How lovely to see you back! I really like the rack. Been too long since I have seen you! The Moon Cakes are adorable, and I enlarged the picture to get a better look. 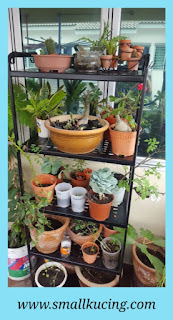 Looks like very soon you will need another shelf unit to hold all your plants! A very helpful and useful helper, J is! Will make a good husband for someone's daughter one day, for sure! Happy Mooncake-making, Kathy... earn tor tor $$$ for the coming days! The plant condo is very nice and so are those piggy mooncakes. I like your new condominium and maybe I should get one too! Cute piggies mooncakes. Mamarazzi is now an expert in making mooncakes! Those cute piggies look delicious! You were very helpful to Mamarazzi on your stay-at-home day :) I remember the ones my son had when he was young. Mamarazzi's moon cakes look delicious. When we lived in California many years ago we were invited to a friend's house for their Moon Festival party. It is such a lovely memory. Mamarazzi's piggy mooncake looks so cute and lovely. Those mooncakes are super cute! The piggie mooncakes are cute! wah really tall condominium!!! but u hav grown tall too....I just had my 'first mooncake for this year' on yesterday. Nice racks! And those mooncakes look so cute.